Amour G started his BD career in 2011. In 6 months and with amazing scores of up to 78.8%, he has won the vast majority of his qualifying classes at Open Novice and Elementary. He qualified for and placed at the summer regionals and at the BD National Championships. Coping so well with the electric atmosphere, he placed 8th in the Open Novice National Championship, described by a List 1 judge as being one of the hottest classes of the show. He was less than 1% behind the 3rd placed combination. Quickly qualifying for the Open Elementary and Open Medium Summer Regionals 2012, he sadly could not compete due to his rider being out of action. However they deflected to Sheegate's Area Festival instead and over two days won all four of their classes, including the Open Medium Area Festival, with scores often up into the 70%s again. Continuing in the same vein, Amour G qualified for the Open Medium regionals 2013, placed 4th in what must have been the highest scoring Open Medium class across the regions and as a result, qualified directly once again for the BD National Championships. During their test at the championships, a very popular horse was retired in the adjoining arena. Even when the crowd errupted, Amour G never missed a beat and all five judges commented on his fantastic temperament to cope with the 'commotion' next door. They performed a steady, safe test and finished just outside the placings. The pair have now qualified for the summer regionals at Advanced Medium again scoring well into the +70%, they have won their first Advanced level test with a respectable 68%, gaining 8s for his tempi changes and extended trot and the aim is to be ready for PSG by the end of the year. Judges comments have included 'Stunning, expressive horse, a pleasure to judge', 'Super talented horse, expressive paces' and 'exciting potential' and in winning the Open Medium Area Festival Championship at Sheepgate recently..... 'Massive talent'! Prior to starting his dressage career, Amour G was lightly show jumped with success. He consistantly jumped double clears in British Novice, Discovery and 1.05 classes and schooled 1.25 at home. As part of his early education, Amour G has also been lightly shown with great success. 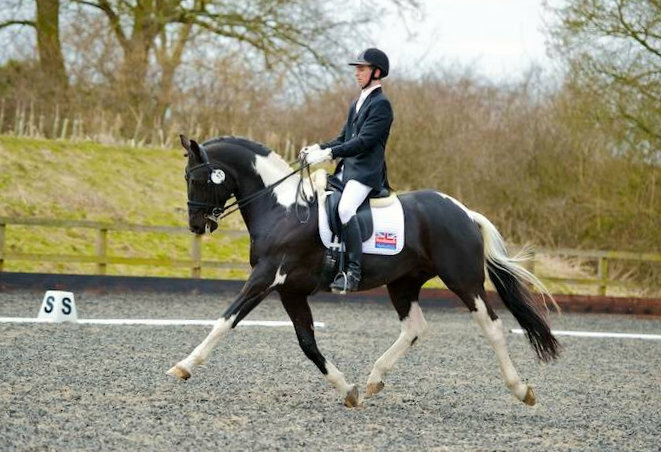 Winner of many sporthorse classes and championships he has also won the coveted BSPA Superstar In Hand Championship twice. 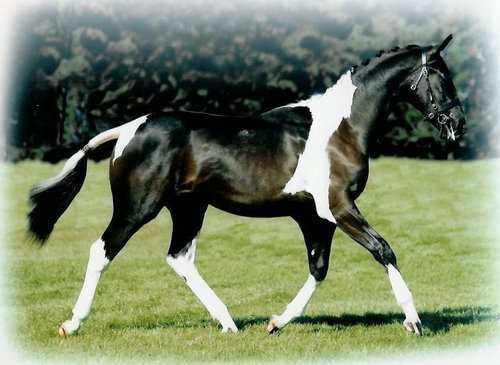 He won the yearling sporthorse class at the Suffolk County show in 2006, the only coloured horse in the class. He was unbeaten in the Eastern Star Championship, winning at 1, 2 and 3 yrs old. Amour G must be one of the most talented coloured stallions at stud today. He is now proven in affiliated dressage, showjumping and showing so you don't have to take our word for it.......the hard facts are there!